The Irish have long been known for their eloquence and mirth which many would simply call blarney. 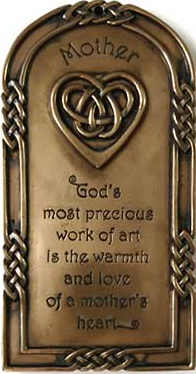 They are also associated with the love of family, and with that in mind, The Irish Gift House offers this collection of Irish blessings for mother along with some Irish witticisms for Mother's Day. Gods most precious work of art is the warmth and love of a mothers heart. Just a few lines to let you know that I am still alive. I am writing this slowly because I know that you can’t read fast. Your won’t know the house when you come home we’ve moved. About your father, he has got a lovely new job. He has 500 men under him, he cuts grass at the cemetery. Your sister Mary had a baby this morning I haven’t found out yet whether it’s a boy or a girl so I don’t know if you’re an aunt or an uncle. I went to the doctors on Thursday and your father came with me. The doctor put a small tube in my mouth and told me not to talk for 10 minutes. Your father offered to buy it from him. Your Uncle Patrick drowned last week in a vat of Irish whiskey at the Dublin brewery. Some of his workmates tried to save him but he fought them off bravely. They cremated him and it took 3 days to put the fire out. It only rained twice this week, first for 3 days then for 4 days. We had a letter from the undertaker. He said if the last payment on your grandmother’s plot wasn’t paid in 7 days, up she comes. For two solid hours, Mrs. Casey told the man sitting next to her on the plane about her grandchildren. She had even produced a plastic-foldout photo album of all twelve of the children. Mrs. Casey finally realized that she had dominated the entire conversation with her grandchildren. "Oh, I've done all the talking, and I'm so sorry. I know you certainly must have something to say. Please tell me, what do you think of my grandchildren?" For Mother's Day, Murphy decided to splurge and took his wife and their four young sons to an upscale restaurant. Murphy ordered a bottle of wine which the waiter brought it over and began the ritual uncorking, and poured a small amount for mom Murphy to taste. Paddy, their six-year-old, exclaimed to the waiter, "Mister, you better fill up that glass, mom drinks a lot more than that." The Irish Gift House wishes all mothers a happy Mother's Day. 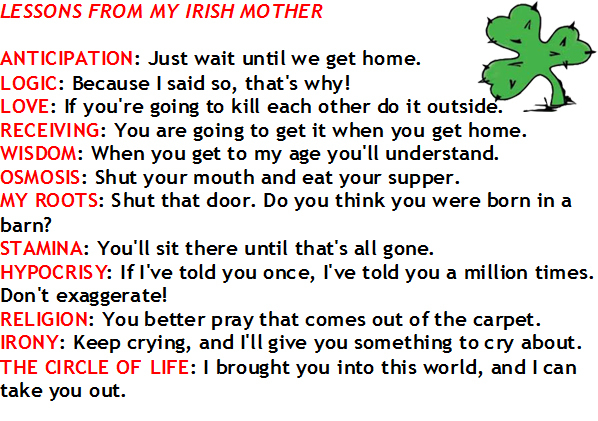 Please visit our site if you are looking for a vast collection of free Irish jokes or Irish blessings for any occasion.